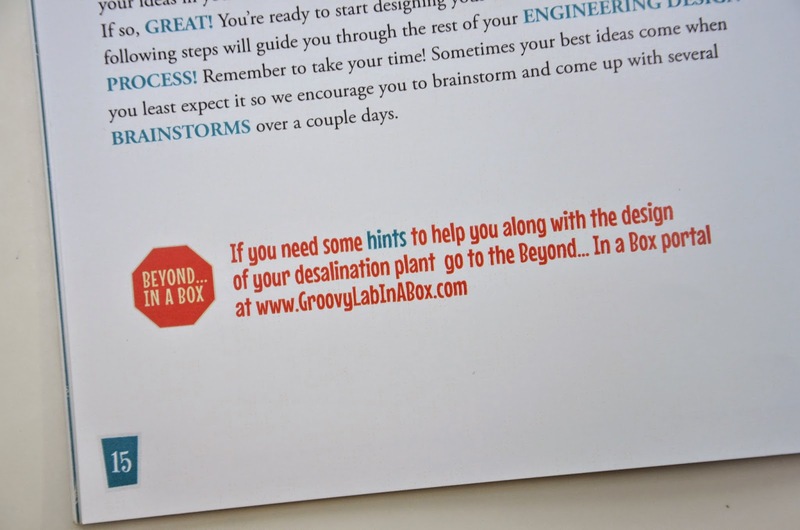 Today, I am excited to introduce you to Groovy Lab in a Box! 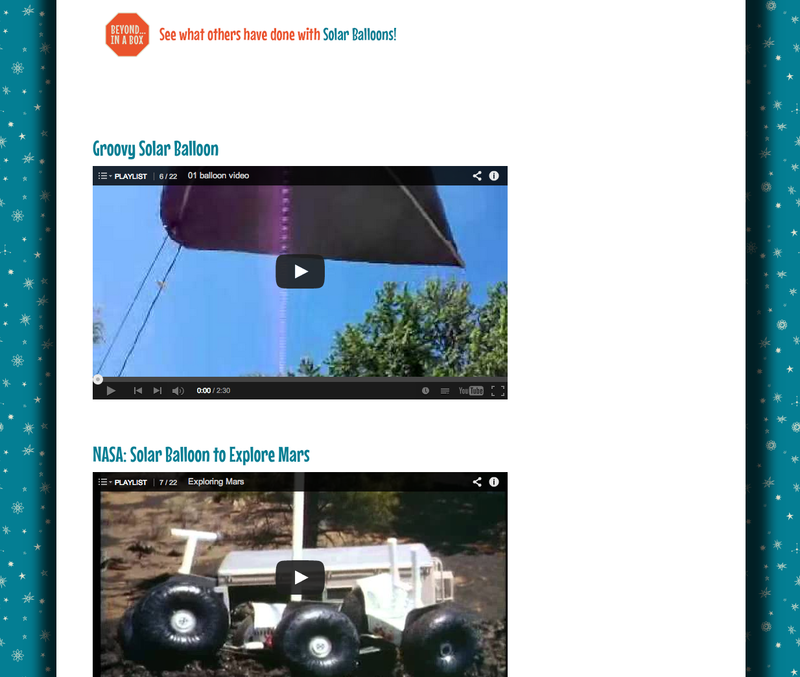 Anything Science is obviously cool in our house, so I was very excited to say Yes, please! to the Groovy Lab team when they contacted me with the invitation to review their box. 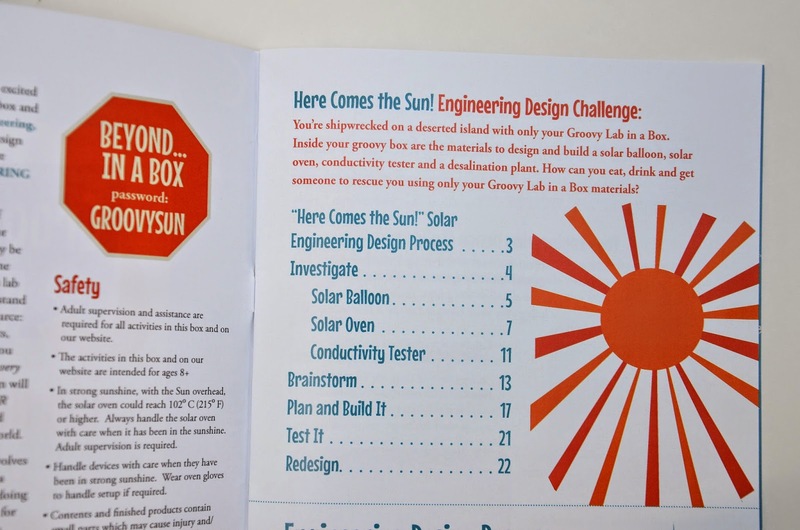 Ours was the Here Comes The Sun box. When it arrived, we unpacked it carefully and took some photos for you. and accompanied by a formidable Lab Notebook. Let's take a peek inside before we further unpack the box. 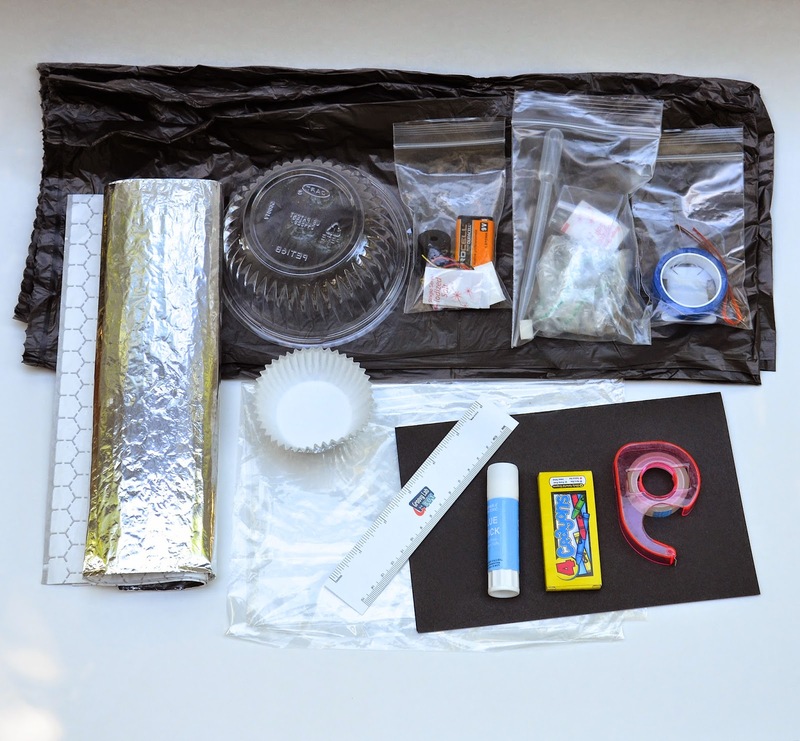 Right at the start, the ultimate aim of this Box is explained: to design a survive-and-rescue operation using Science (and some craft materials). 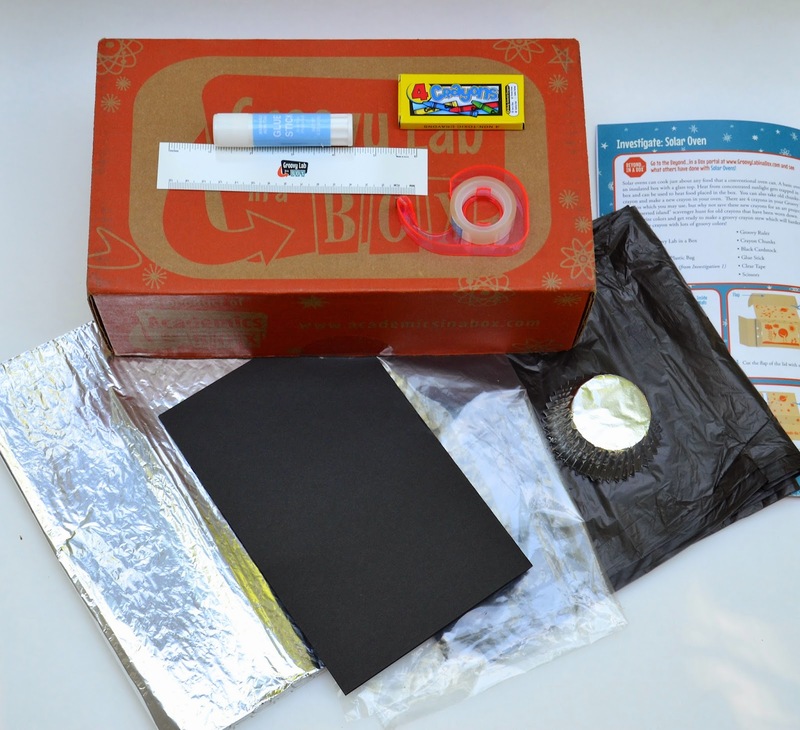 The premise, according to the team that conceptualized and created this product, is that children are natural engineers and, with a combination of scientific inquiry and engineering design, are capable of ingenious and deliberate inventions that solve problems. 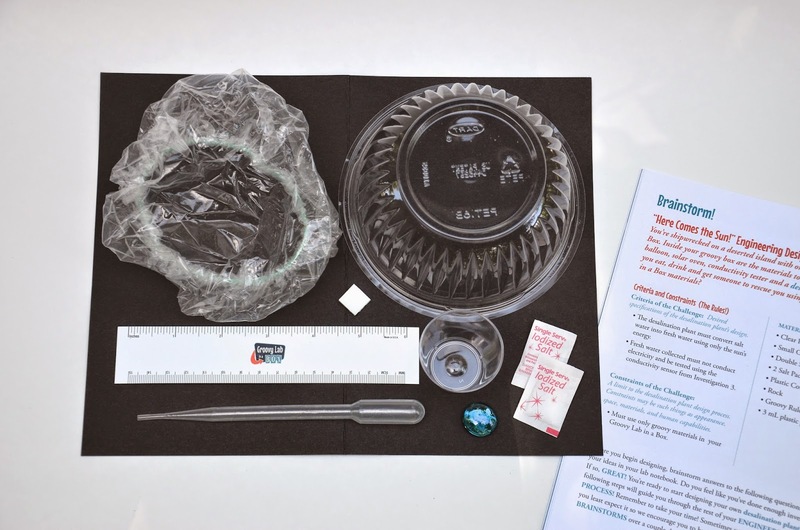 It's a timely new angle on the ubiquitous craft crate-kit, given the popular STEM (Science, Technology, Engineering, Mathematics) wave on which educators all over the state, not to mention the world, are currently riding. And this is not a kit, its creators emphasize. 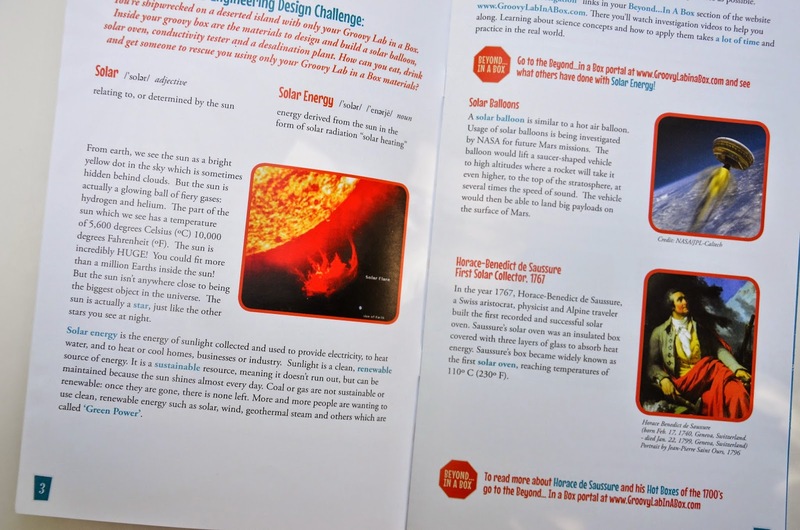 It is a scientific experience pitched at a level at which kids 8 and older may be engaged to engineer a design based on knowledge and accumulated learning. There are hints on the website if you need a little more direction. Now, let's unpack each experiment. The instructions called for a hot, uncloudy, unwindy day. 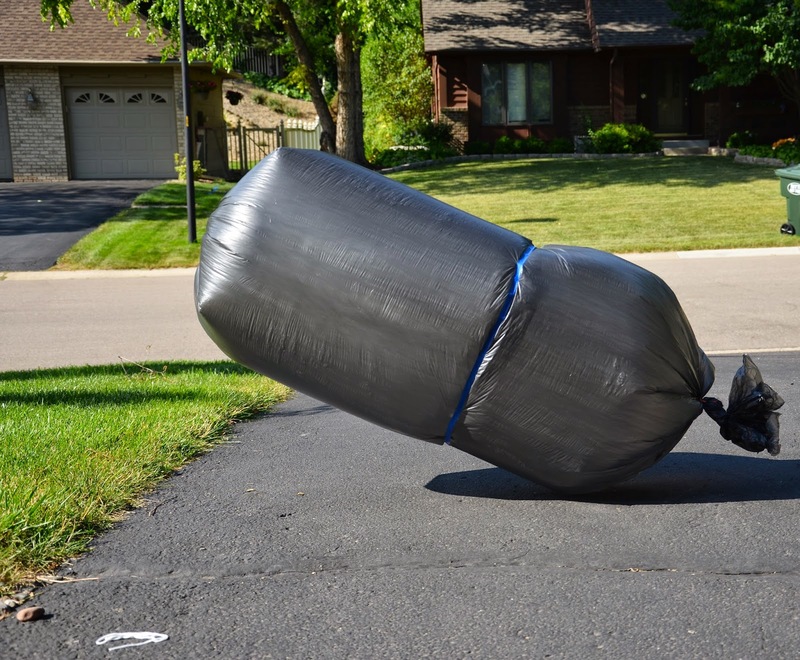 We waited a long time for such a day, but believe it or not, the Minnesota summer failed us. 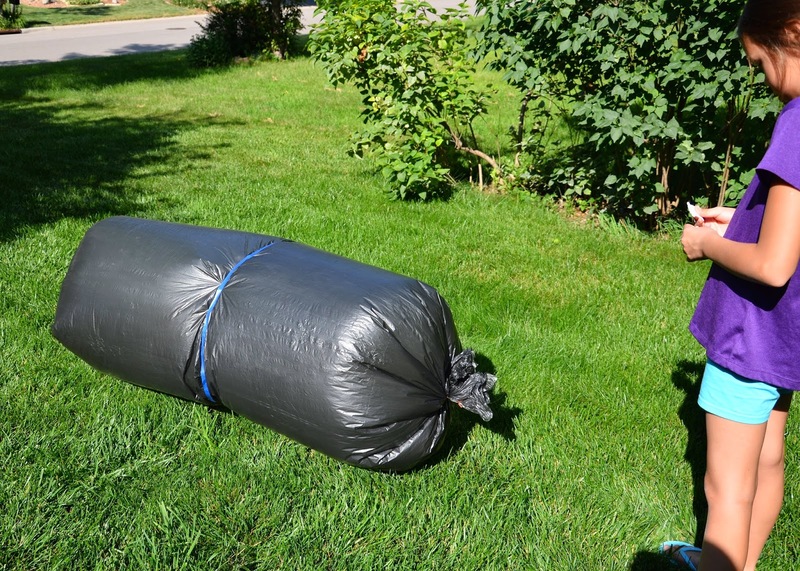 Finally, when the children refused to continue holding out, we constructed our balloon on the very next non-rainy early summer afternoon. There was a fair bit of wind, and it was not as hot as we'd have liked. We did our best. 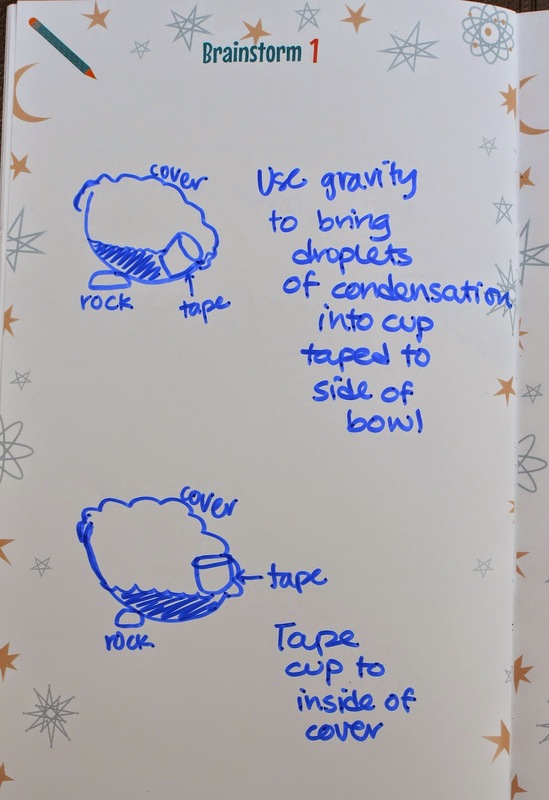 Our balloon leaked slightly and shrank at a small but noticeable rate, so we reduced the volume continually, to keep the internal air pressure constant. 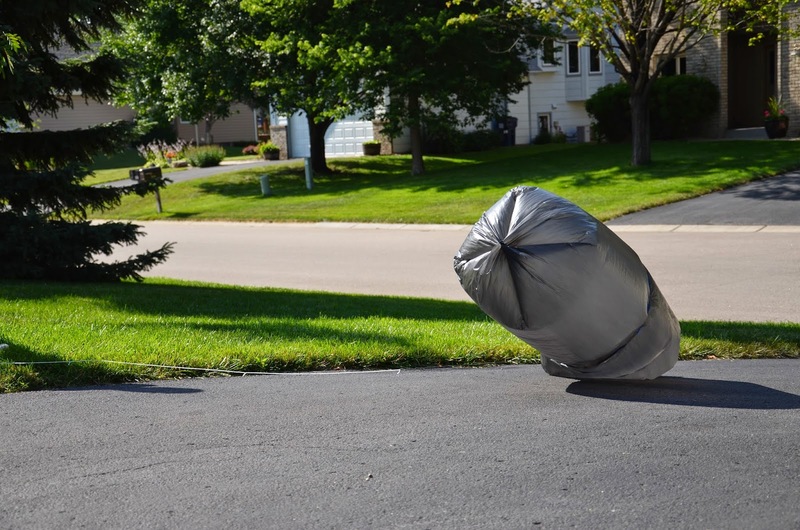 It lifted off the ground but it never got anywhere near high-altitude airborne. Maybe if we lived in Texas. . . or Kuala Lumpur. . . 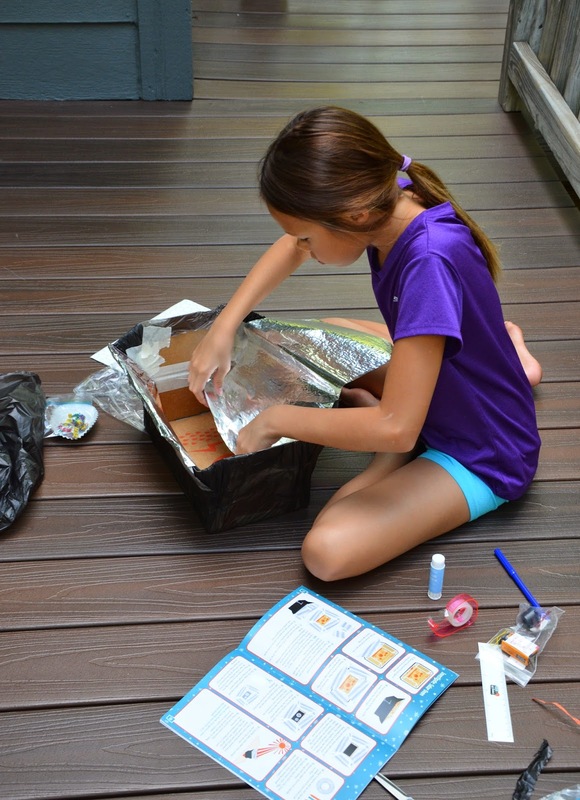 Experiment 2 was to build a working solar oven. 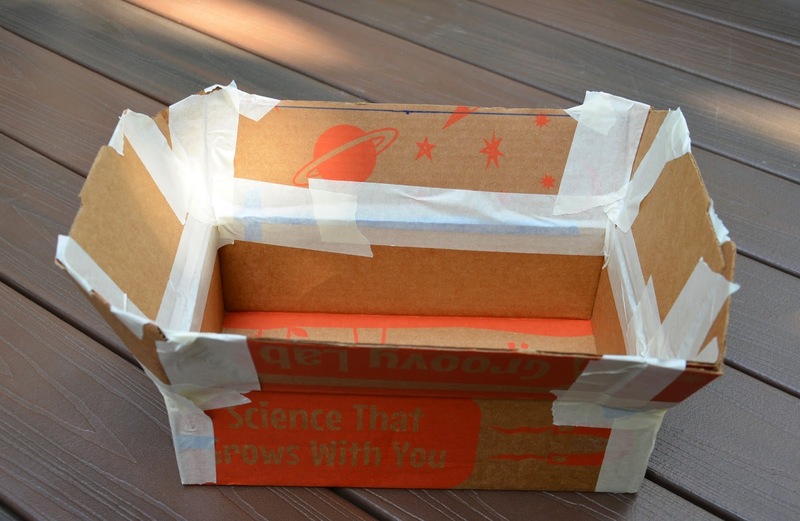 I absolutely loved it, primarily because it utilized the cardboard box in which the materials were packed. 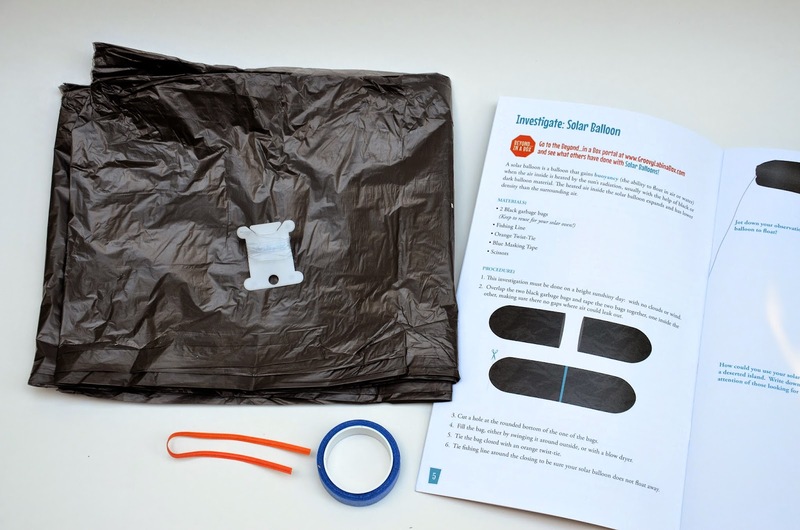 I've reviewed other activity crates in the past and none of them included an activity that actually involved the box itself. What a pity, because the box is the best part of any package! But you all knew I was going to say that. so we used our own. Incidentally, I mentioned this in my feedback to the team, and they were fabulous and said they'd be working on making it better. 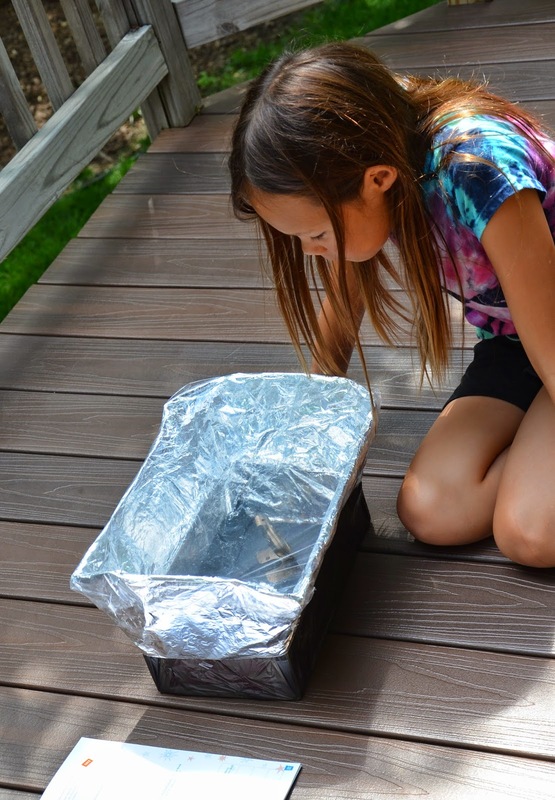 Here's Emily lining the oven with foil-backed paper. 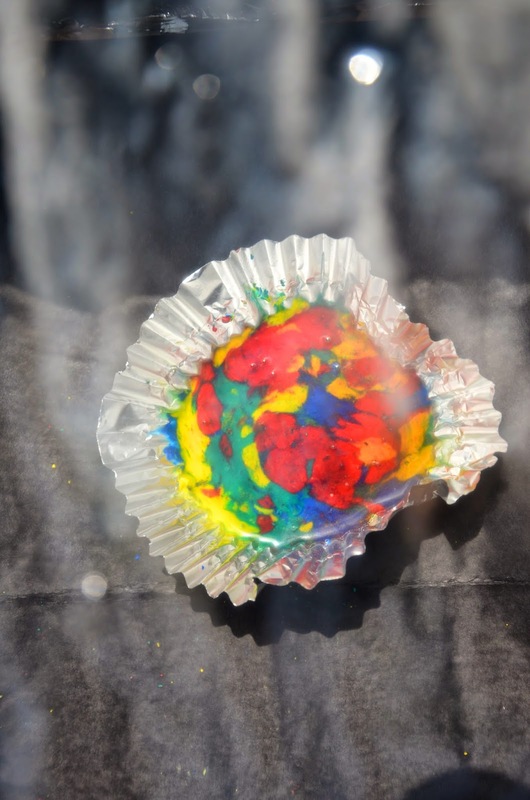 When it was done, we put in a little cupcake liner of crayon bits (all provided) and our own oven thermometer (because we're such Science geeks) to monitor the goings-on. 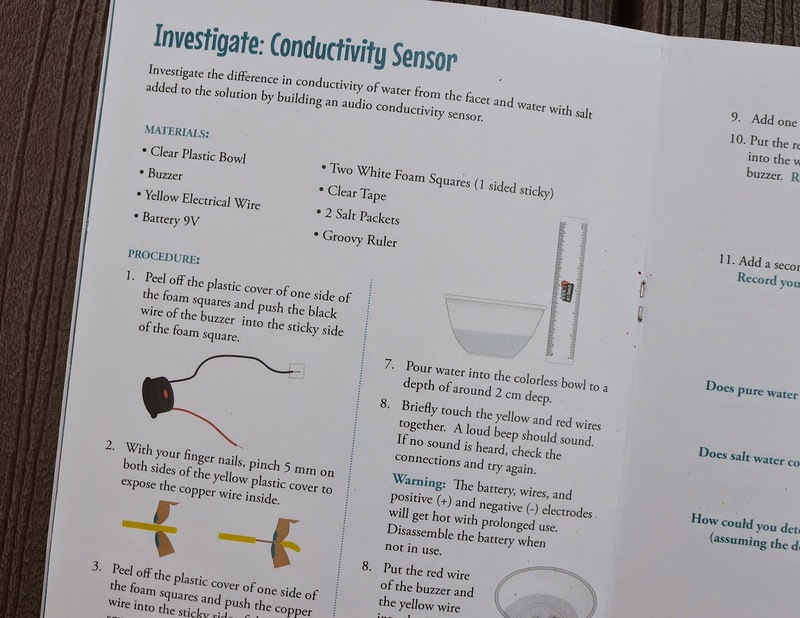 Experiment #3 was a conductivity sensor. Following the instructions completely, the connection in the resulting circuit was a little intermittent, but we fixed it with a tiny bit of improvisation. Problem-solving, after all, is part of the scientific process, isn't it? 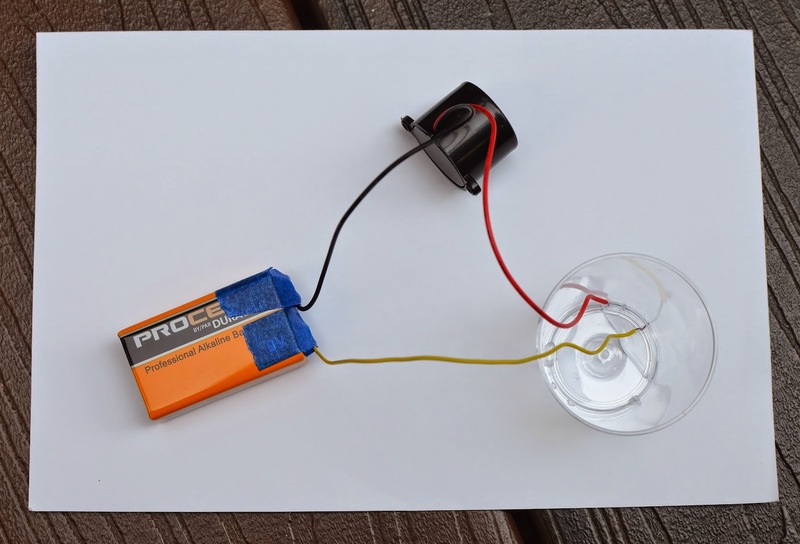 So here's how it works - you need a closed circuit to make the buzzer sound. 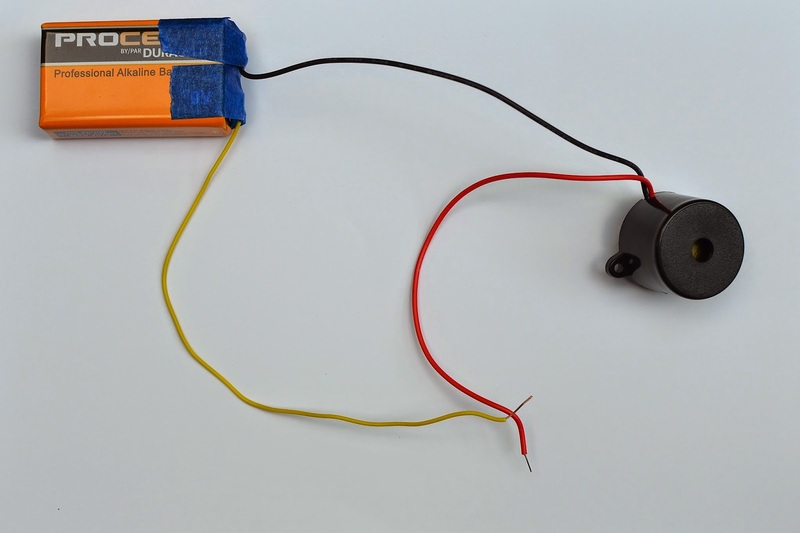 You'll get a closed circuit if the thing between the two wire ends conducts electricity. 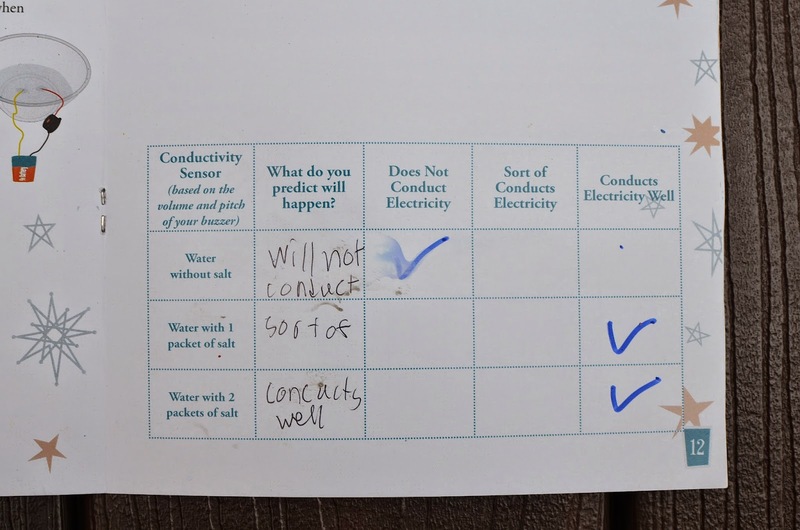 When the thing is pure water, the buzzer doesn't sound, therefore pure water doesn't conduct electricity. 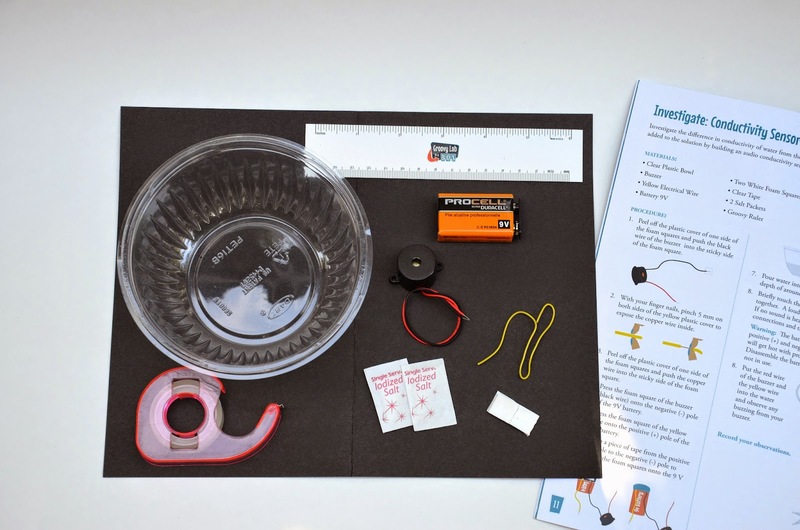 When the thing is salt water, the buzzer sounds, therefore salt water conducts electricity. Emily wrote her observations here. She and I also discussed at length the concept of conductivity and its link to a closed circuit, to help her fully grasp the theory. You obviously don't have to do this because you are normal. I, on the other hand, have a problem discerning where Science Teacher ends and Mother begins. 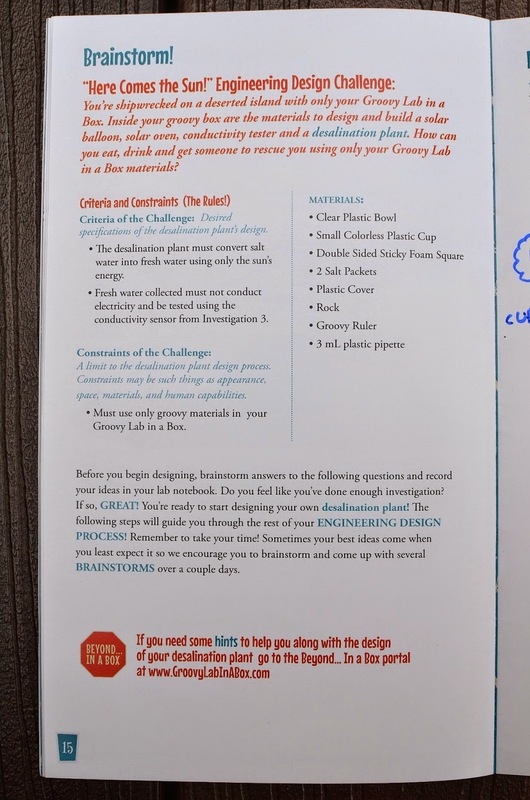 And then it was time for the Design Challenge. 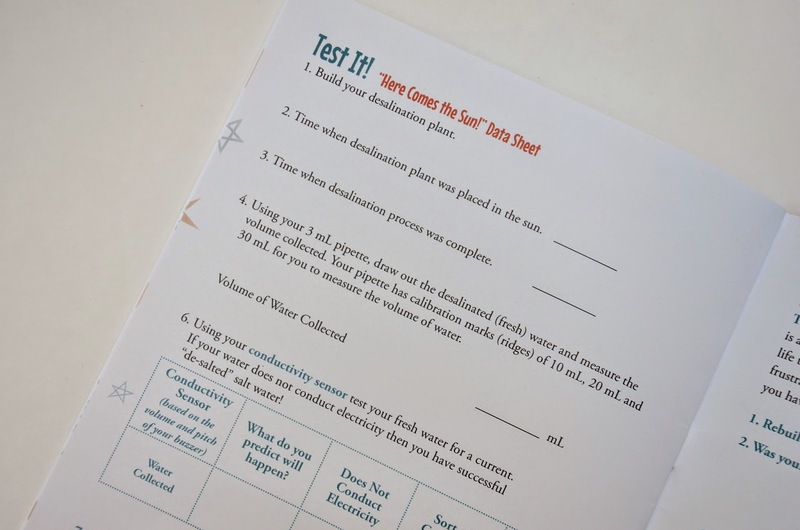 Loads of fun assimilating all the experiments into conceptualizing the desalination plant. There is a guided-report section to help kids process their learning. I did the actual drawing of Prototype 1. This is how much pure water we collected before the sun disappeared behind wretched clouds, yet another instance of being played out by the Minnesota summer. 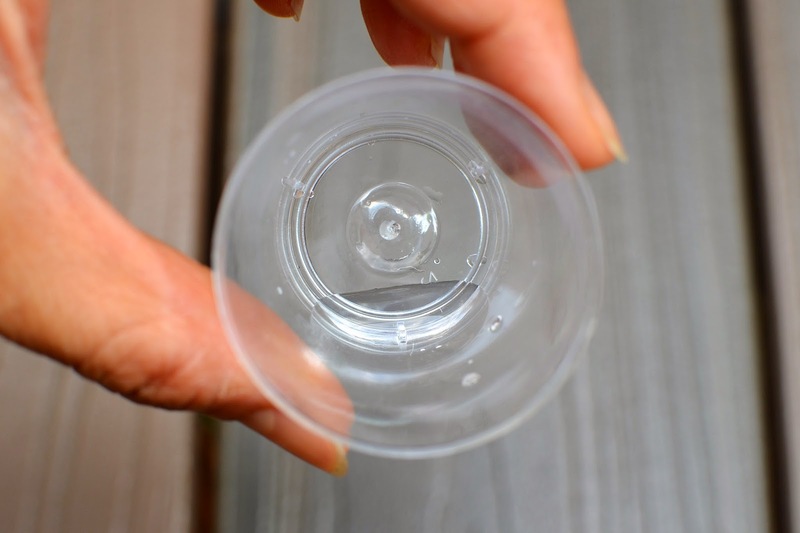 We tasted the water and circuit-tested it to verify that, indeed, it contained no salt. 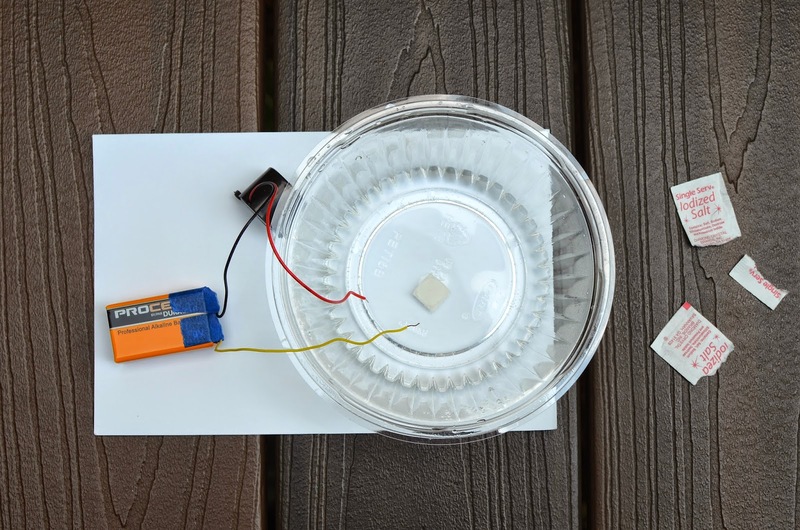 Just for fun, we postulated another prototype, to see if we could collect more water. Super fancy, but even without carrying it out, one can tell we were going to lose a fair bit of our precious pure water by either spillage or side flow leakage. 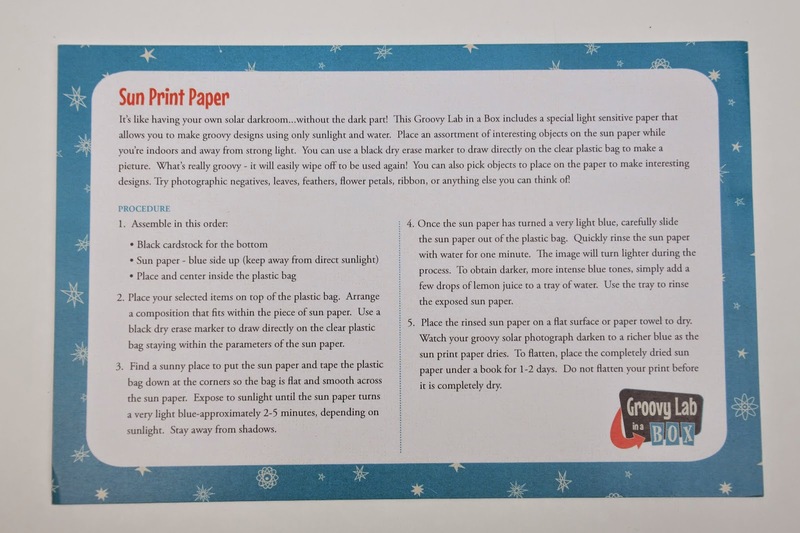 The last activity was an stand-alone fun craft: sun print paper. 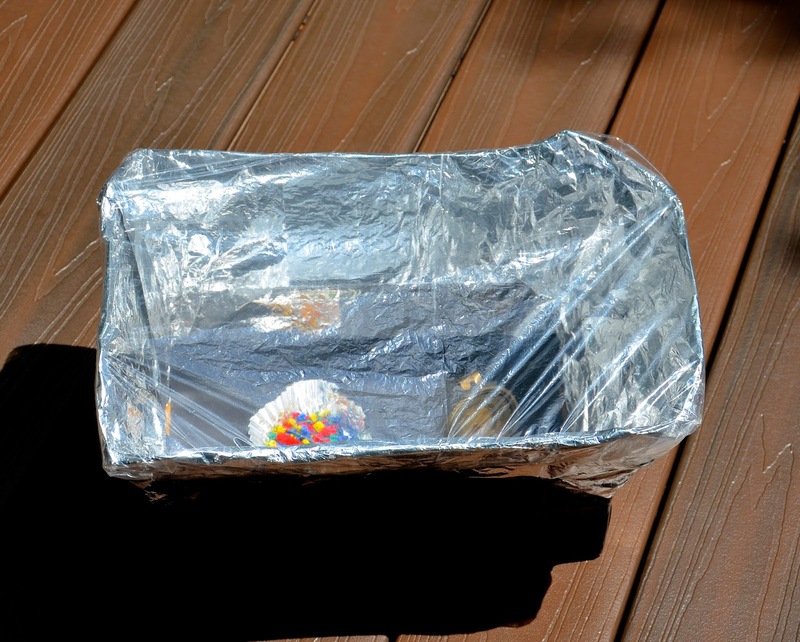 We set out the two sheets provided and exposed them to the sun. All it took was a few minutes to turn white (see the paper on the right). Unfortunately, the wind (thanks again, Minnesota) messed up our final images, so there are no photos of them. Instead, you can go see the ones we made indoors some years back here. 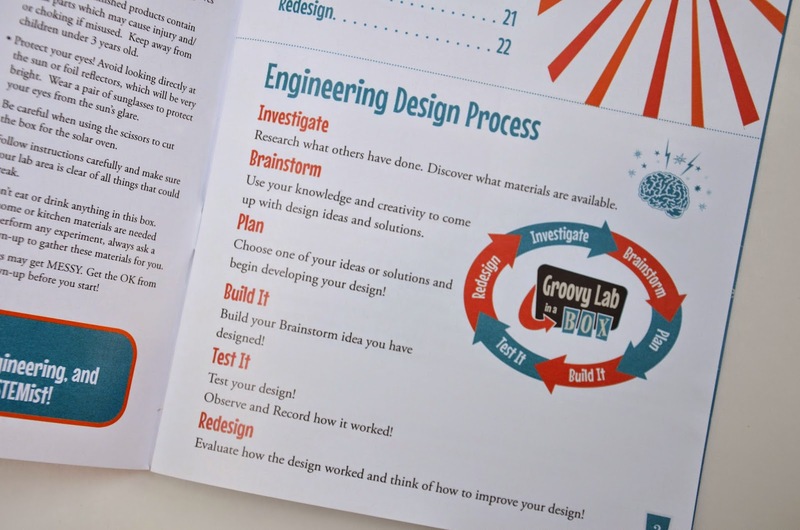 We really enjoyed working with this Groovy Lab box. 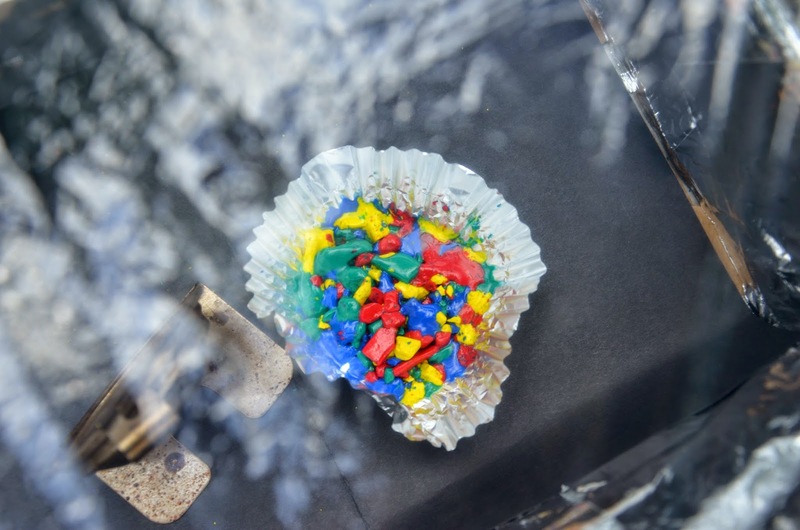 We took our time with it because I wanted the kids to be able to assimilate their learning at their own pace instead of simply devouring all the activities at face value. 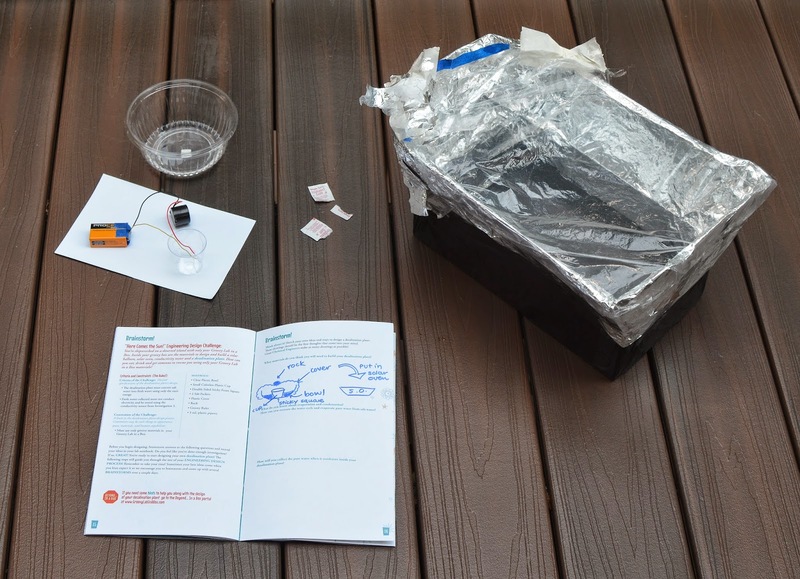 This was a well-thought-out theme and the experiments are straightforward and engaging. 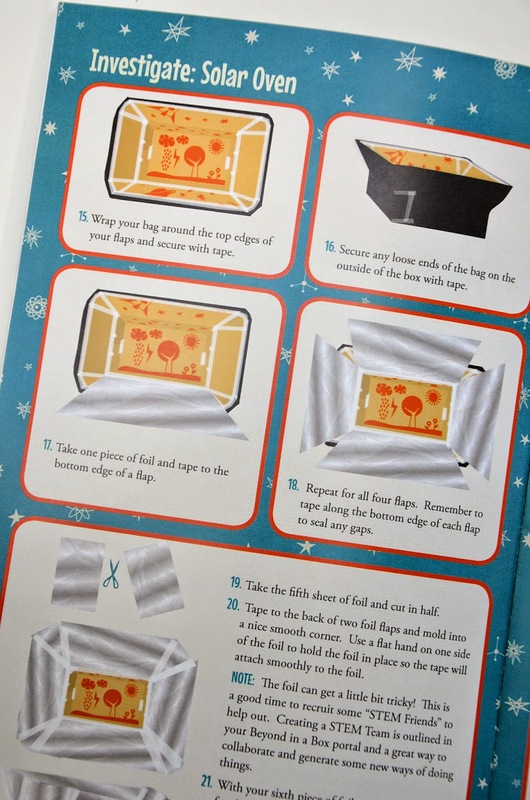 I love the step-by-step instructions and diagrams and the Notebook that reads like a mini-manual. 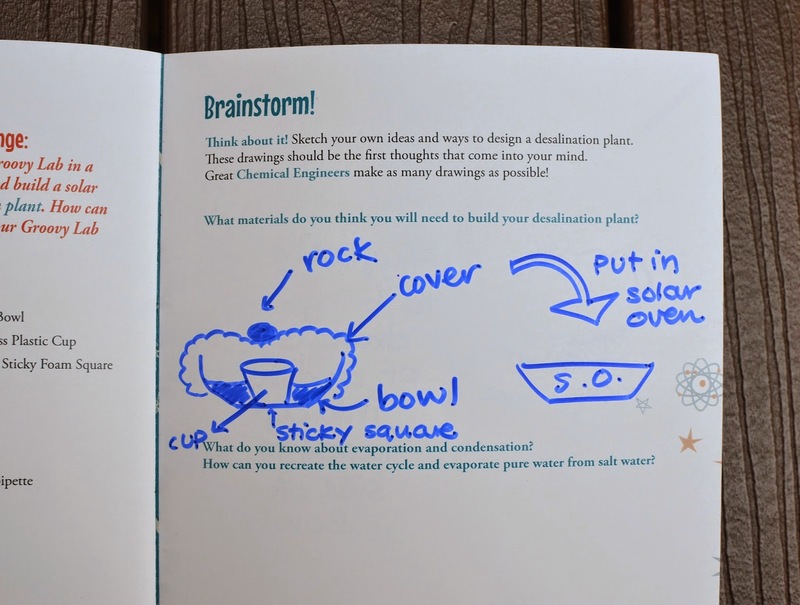 I especially love that the answers aren't spoon-fed to the kids, and that all the experiments, taken together, equip them to knowledgeably and independently design that big challenge at the end. Now, while all three of my kids worked on some aspect of the contents of the box, I'd say that older kids would probably enjoy it most. Therefore the age rating (8+) is spot-on. 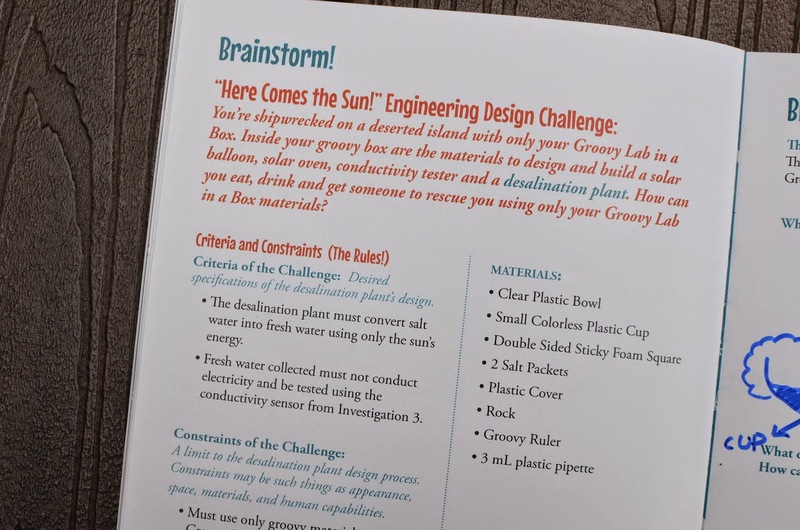 I'd also say that while an analytical mind helps you get the most out of the Groovy Lab Box, you don't need to be Science-oriented to appreciate it. 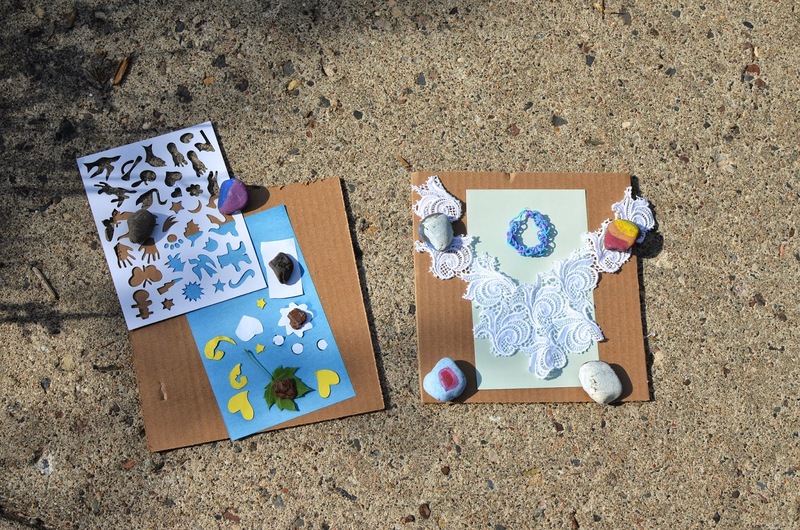 Children, especially, will be thrilled to tinker with the materials and if your kids are anything like mine, they'll love being able to make things that "actually do stuff". And if you're all geeky and/or want to use it in an educational setting, it has loads of potential for side discussions and more theoretical applications. 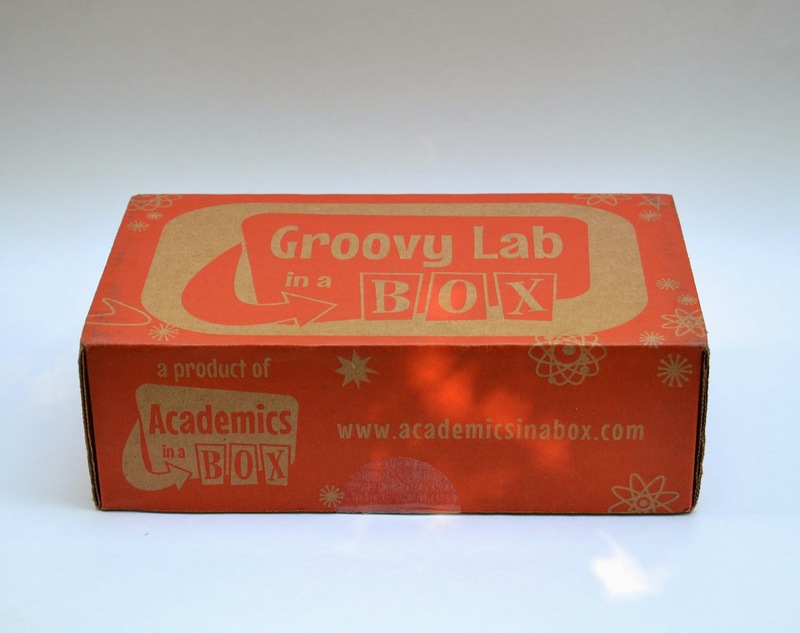 Here is some info on how you can get your hands on these Groovy Lab Boxes. First, you can buy them by subscription, so they are sent to your home monthly. 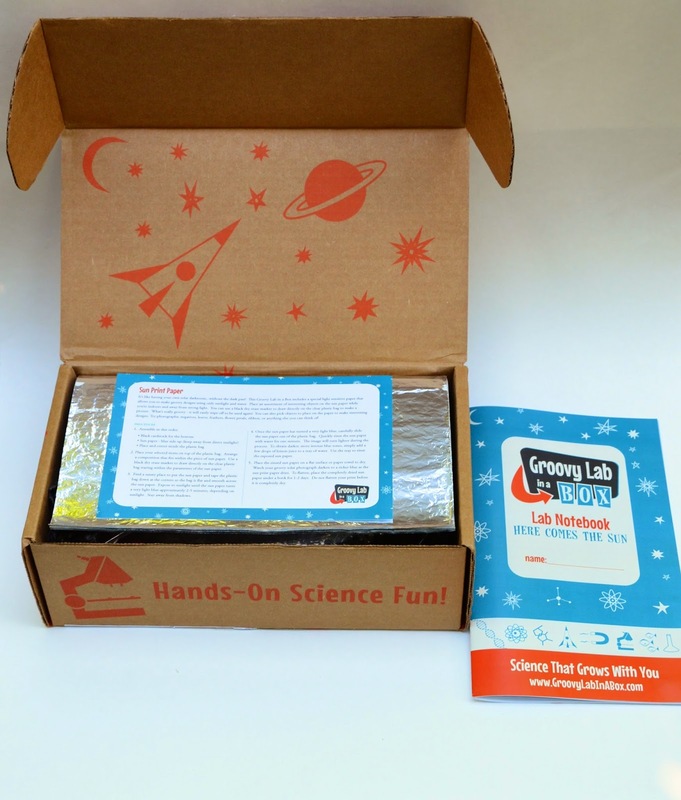 Each box contains single-serving experiments, but multiple children can easily work as a team (or take turns to repeat some of the experiments) without having to purchase one-box-per-kid. 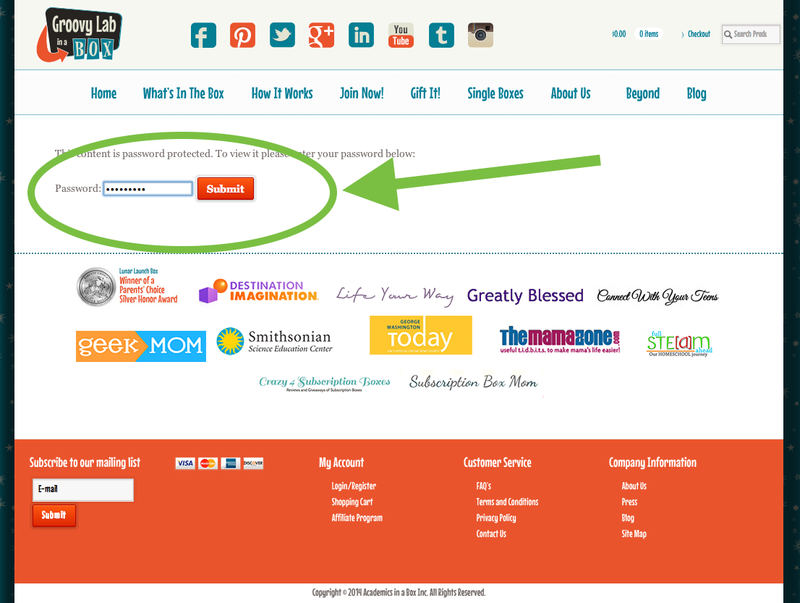 Subscriptions can be for 1 to 12 months. Read more about subscriptions and pricing here. 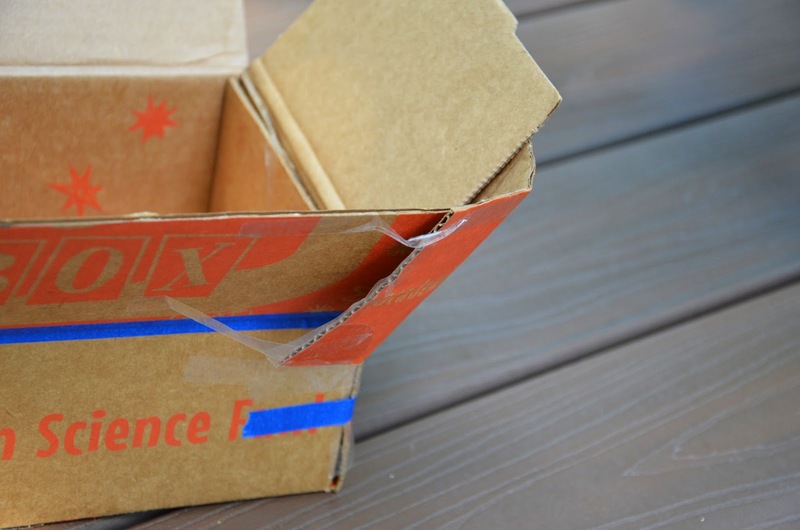 Second, you can buy single boxes here, which would make perfect one-time gifts. 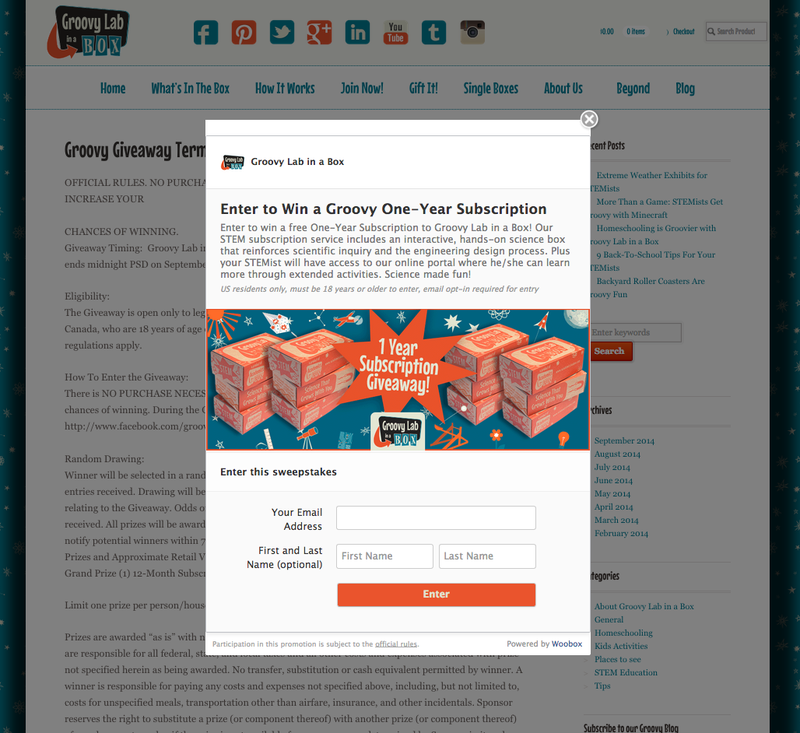 Third, there is a giveaway of a Groovy one-year subscription on the Groovy Lab website here, which ends tomorrow (Sep 15). If you go to the website before midnight tomorrow, a pop-up window will appear to allow you to enter the giveaway, so hurry! 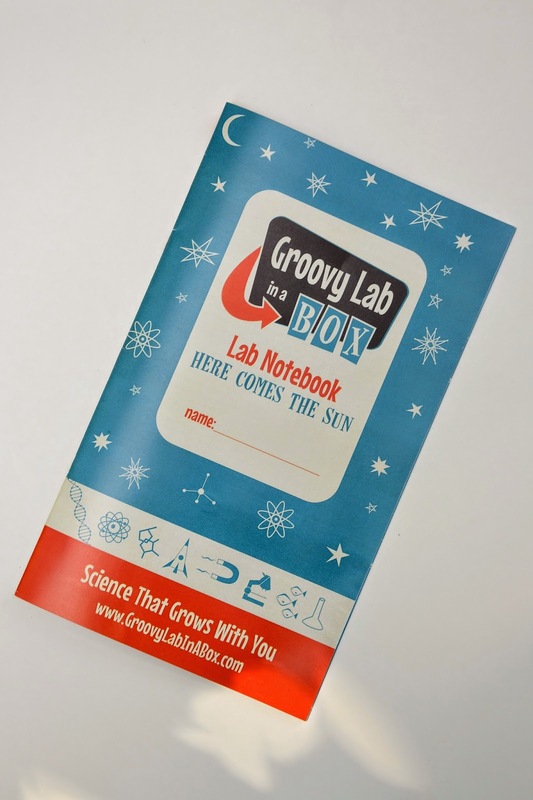 Fourth, the Groovy Lab team have generously offered a coupon code to my readers, valid for the monthly subscription. The code "GROOVYNOW20" will get you a 20% discount off your first month's box. Disclaimer: I received this box for free but the opinions in this review are mine. Along these same lines I was wondering if you and your girls have ever tried the GoldieBlox building toys (engineering toys aimed at girls)? No, I haven't tried GoldieBlox. I've seen it in Target, though. The most recent thing the girls are into is Makey-Makey. It's awesome. This is so cool! Thanks for sharing this n box with us. 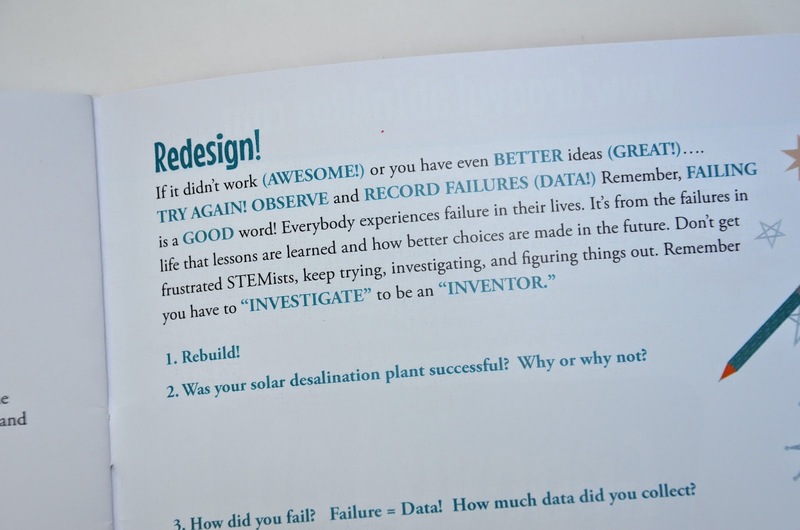 Sounds like the perfect way to incorporate science for homeschool. I have a feeling my boss will love these. That looks like great fun! And educational besides... can't beat that! Ooh, how fun!! I will definitely be buying one! This is an impressive kit! I really like that they include everything you need.